It may come as a surprise to learn that one of the earliest descriptions of Orthodox worship in Alaska comes not from the pen of a Russian missionary or fur trader, but from that of a young Anglo-American explorer who visited the “Great Land” in 1778, sixteen years before the first missionaries arrived in Kodiak. His name was John Ledyard, born in the small town of Groton, Connecticut, in 1751. Having dropped out of Dartmouth College, New Hampshire, he embarked upon a life of travel. After a brief visit to the British colony of Gibraltar at the southern tip of Spain, he made his way to England and joined the British navy. One month before his fellow countrymen were to declare their independence from Great Britain, Ledyard set sail from London in June 1776 in the service of Captain Cook, bound for the Pacific as a member of the Royal marines. By the summer of 1778 the expedition had reached southwest Alaska and in October of that year they came to Unalaska in the Aleutian islands of southeast Alaska. At the recommendation of John Gore, the first lieutenant of his ship The Resolution, Ledyard went on shore and traveled for several days. Ledyard describes Gore as his intimate friend and a native of America as well as myself. Gore was most likely a Virginian. After I had lain down, the Russians assembled the Indians in a very silent manner, and said prayers after the manner of the Greek Church, which is much like the Roman. I could not but observe with what particular satisfaction the Indians performed their devoirs to God, through the medium of their little crucifixes, and with what pleasure they went through the multitude of ceremonies attendant on that sort of worship. I think it is a religion the best calculated in the world to gain proselytes, when the people are either unwilling or unable to speculate, or when they cannot be made acquainted with the history and principles of Christianity without a former education. Ledyard had come to Paris in the hope of forming a company to engage in the fur trade of the Western coast of America. He was disappointed in this, and being out of business and of a roaming, restless character, I suggested to him the enterprise of exploring the western part of our continent, by passing through St. Petersburg to Kamchatka, and procuring a passage there in some of the Russian vessels to Nootka Sound, whence he might make his way across the continent to America; and I undertook to have the permission of the Empress of Russia solicited. Had Ledyard succeeded in making the journey Jefferson outlined his place in history would probably rival, if not exceed that of Lewis and Clark who were to follow a similar mandate from Jefferson some twenty years later. Ledyard set out on his monumental journey and made it as far a Yakutsk in eastern Siberia, a journey of some 7500 miles overland and within several hundred miles of the Russian Pacific coast. There he was arrested as a spy and forced to return via St. Petersburg to London! Whilst on this trip Ledyard had several meetings with Gregory Shelikhov in Irkutsk, Siberia. At this point Shelikhov had returned to Siberia after founding the Russian settlement of Three Saints Bay on Kodiak Island, Alaska, in 1784. It was the Shelikhov-Golikov company that would later sponsor sending the future St Herman and other Russian Orthodox missionaries to Kodiak in 1794. (Although it should be noted that Shelikhov asked for only one priest to be sent to the fledgling settlement at Three Saints Bay.) Ledyard’s interest in the Pacific north-west fur trade was most probably what led to his expulsion from Russia. Catherine the Great was eager to integrate Russian America into her empire in the face of emerging competition from the Americans, British and Spanish. It is in this context the Orthodox mission six years later arises. Ledyard also records meeting with the Orthodox Archbishop in Irkutsk and visiting the village of St. Nicholas, with its church of that dedication on the shores of nearby Lake Baikal. The city of Cairo is about half as large in size as Paris, and is said to contain several hundred thousand inhabitants. You will therefore anticipate the fact of its narrow streets and high houses. In this number are contained one hundred thousand Copts, or descendents of the ancient Egyptians. These are likewise Christians, and those of different sects, from Jerusalem, Damascus, Aleppo and other parts of Syria. 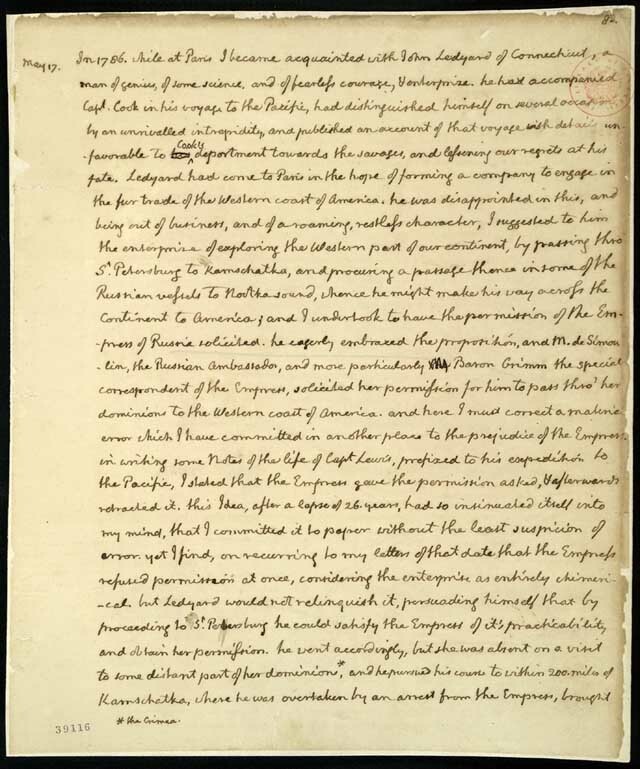 After extensive travels throughout Egypt Ledyard wrote the last letter of his life (still extant) to Jefferson on November 15, 1788. Shortly after this he died of a fever in his thirty-eighth year and was buried in Cairo. 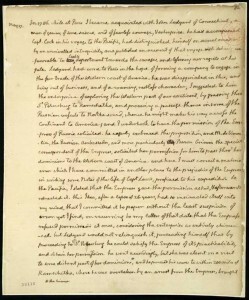 The account of his travels with Captain Cook was published in Connecticut in 1783. This is the first work ever published in America to be subject to copyright law. As a publisher myself, who was born in the British crown colony of Gibraltar and spent a portion of childhood in Ledyard’s home town of Groton, Connecticut, it is hard not to identify with him. Even more so after having made three trips to Alaska, visited the grave of Gregory Shelikhov in Irkutsk and celebrated the feast of Pentecost 1988 in the church of St. Nicholas, on the shores of Lake Baikal, Siberia.